Raised in the foothills of Algeria's Berber Mountains, Hamza Bounoua lives and works in Kuwait. Antiquity meets the current is the best way to describe his vibrantly abstracted paintings and through vivacious forms, Bounoua breathes history into color, evoking our connection with the past. A hybrid of the present and its precedent, Bounoua's forms are deeply inspired by Arabic calligraphy and Berber signs, as well as Eastern spirituality. 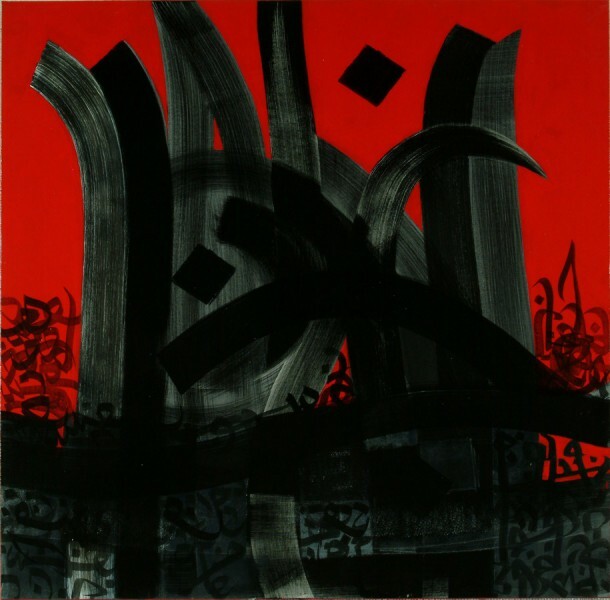 Enthused by the North African art, Bounoua paints on reverse plexi-glass, saying that "arabic calligraphy and Berber signs are interlaced with color and other forms and symbols from Africa, the Orient and the West. They cannot be read or decrypted in themselves but contribute to the whole painting to give an impression of spiritual harmony and peace out of chaos." His works search for a tranquil path in contemporary life, combining elements of the bygone with the modern.